Many automotive motorists simply are not taking their driving task seriously. Distractions are everywhere and some seem to think cruising down a public road is a passive activity rather, it’s a complex task that involves concentration and more than just knowing how to use the accelerator, brakes, and steering. Look For Motorcyclists — Use your eyes and mirrors to see what’s around, and check the blind spots when you’re changing lanes or turning at intersections. Look, and look again. Focus on Driving — Don’t Text, hang up the phone, put down the eye lash liner brush, stop adjusting the sound system, ignore the navigation system, settle the passengers, and DRIVE. Use Your Turn Signals — Signal your intentions for everyone’s safety. Give Motorcycles Some Room — Don’t tailgate or pass too closely. Take Your Time — Nothing is as important as the safety of your loved ones, yourself, and the others with whom you share the road. Key messages for motorcycle enthusiasts? Responsible riding habits are paramount and always worthy of special attention. 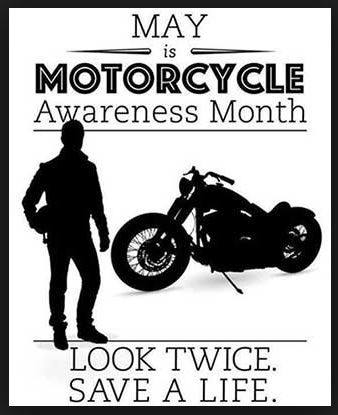 May is Motorcycle Awareness Month and it’s time to remind everyone about driver safety. Please keep your mind on the road! 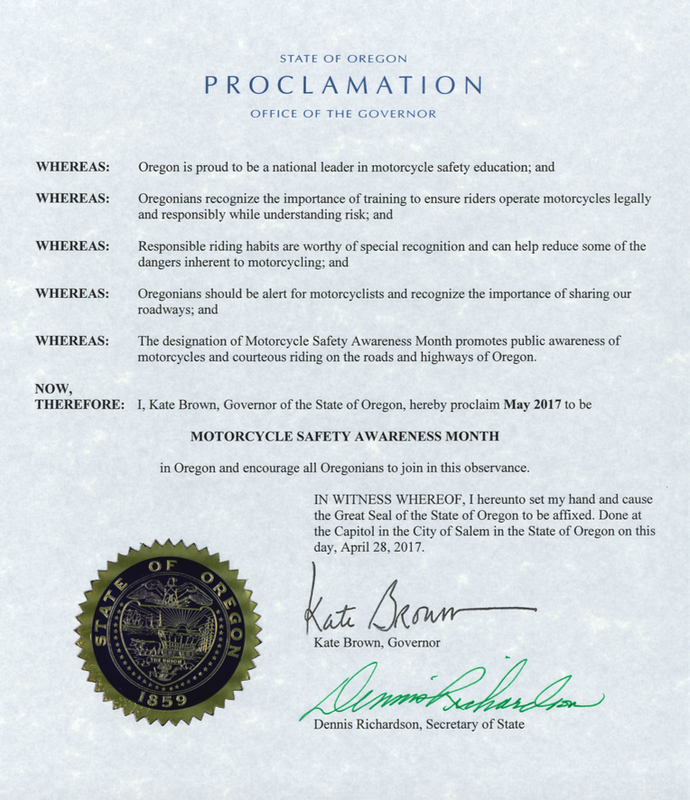 NOTE: As of the blog posting time stamp there’s been NO proclamation from Oregon’s 38th Governor or the Governor’s Advisory Committee on Motorcycle Safety on the May 2017 Motorcycle Awareness Month. Of course members are supportive of everyone being a responsible rider with efforts centered on training to improve rider skills and communicating the dangers of motorcycling, but a statement for this year has yet to be released. UPDATED: May 4, 2017 — CORRECTION: Governor Brown did sign a 2017 proclamation in late April about May being Motorcycle Awareness Month. See HERE. Photo courtesy of Motorcycle Rider News.